A very useful feature of Magnet Commerce is the "Clone" product option, which can be used to quickly add products to an e-store's catalog. You will find this feature at the bottom of the product presentation page - which you can get to by clicking "Catalog > Products" in the Administration Panel and choosing the product to clone. Let's assume that you want to add the Canon PowerShot A610 digital camera model to your catalog, under the "Digital Cameras" directory. The easiest way to do this would be to clone a product with similar properties (e.g. product listed under the same category, with similar filters and related products etc.). 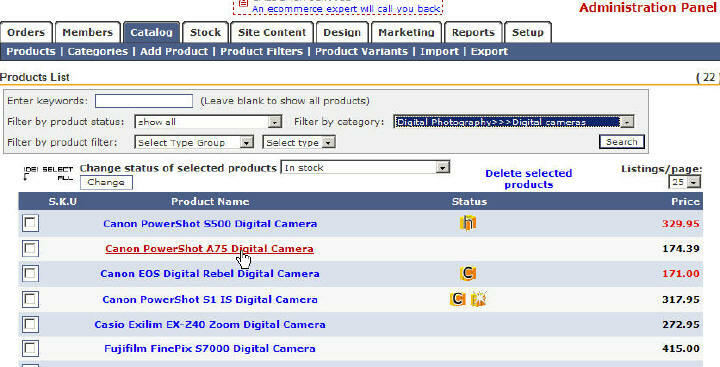 So in this case you would go to the Digital Cameras product list (by clicking "Catalog > Products" and searching for the products under the "Digital Cameras" category) and click on the Canon PowerShot S500 Digital Camera to edit this product. Figure: Choose to clone a product with similar presentation, pricing and promotion properties to the new product you want to add to the catalog. Having chosen a product to edit, you will be transferred to the product's presentation page. At the bottom of this page, you will find the "Other actions" section in which the Clone feature is listed. Click on the "Clone" link to create a copy of the current product. Figure: Click on the "Clone" link in the product editor page to create a copy of the current product. The copy will have all presentation, pricing and promotion features of the initial product, apart from the images. You will only need to edit the fields that are different for the new product (e.g. product code, name, description, images etc.) and save your changes. For more information on the product editing process read through the Add a product section. Make good use of the "Clone" feature whenever possible, to add new products quickly and efficiently! Use the "Clone" feature whenever you want to add new products that are similar to the existing ones in your catalog. Edit the product you want to clone and click on the "Clone" link situated at the bottom of the product presentation editor page. In the copy created, edit the fields that are different for the new product and save your changes. Choose to clone a product with similar properties (e.g. product listed under the same category, with similar filters and related products etc.) to the new product you want to add. Use the "Clone" feature whenever possible, to add new products quickly and efficiently.